Relax on a warm beach, sipping coconut milk and listening to the tropical birds sing while the ocean waves gently lap against the sandy shore. Click here to play! This can be an everyday occurrence if you make your Paradise Dreams come true. And paradise wouldn't be complete without loads of cash! The Beach Babe will show you how to really live it up in Paradise. Watch out for her on reels 1, 3 and 5. She'll substitute for all other symbols and double prizes when she appears in a winning combination. If you can gather up five Tropical Birds, you'll see 2500 times your original line bet. Five Tropical Fish and Five Coconuts will also pay out, 1000 times and 500 times your bet respectively. If you happen to spin two to five Islands anywhere on the board, you're total bet will be multiplied accordingly. This symbol can also trigger bonus features in which you'll maximize your winning opportunities. Head to Paradise right now, all you have to do is relax in the warming sun to win loads of cash. The Island symbols act as scatters. Two or more of these anywhere on the board will mulitply your total bet. Three or more will activate a free game feature in which you get 10 free games. If, during these games, any butterfly symbols appear you will be awarded a bonus prize. All of the prizes are doubled during free games and three ore more Islands will give you 10 more free games. The sun kissed Beach Babe will substitute for all other symbols. She only appears on reels 1, 3 and 5. She will double all prizes when she appears in a winning combination. 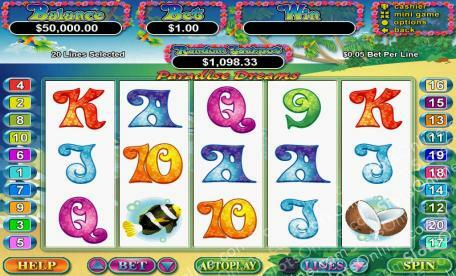 Three or more scatter symbols may trigger the Paradise Pick Bonus game in which you pick five of the 12 flowers that are displayed on the screen. These will reveal multipliers up to 1000 times your triggering bet per pick. If you get a Butterfly, you'll get another 5 picks.